Flowers can be a brilliant way to decorate your home at Christmas. They bring a more natural feel to a room’s de’cor than some other ornaments and decorations. You can also use flowers to add colours to the table on Christmas Day and flowers play a huge part in your festive decorating. At Hanoi Flower Shop, we offer beautiful Christmas flowers and gifts that will brighten your loved one’s days. Known as the leading online florist, with us you can order flowers, plants and gifts for loved ones at the click of a button. What’s more, our same-day delivery service ensures your gift arrives on time. Check out Hanoi Flower Shop Christmas Flowers section for popular gift ideas. 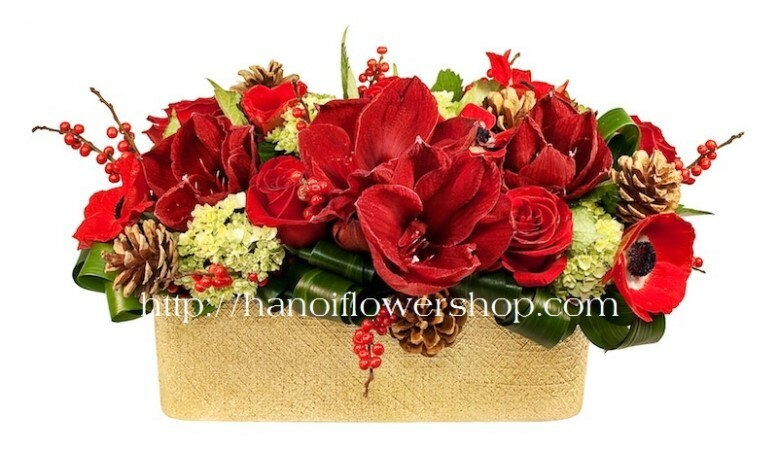 This entry was posted in Hanoi Christmas Flowers and tagged christmas arrangement, christmas bouquet, hanoi beautiful flowers, hanoi flowers on December 16, 2015 by hanoiflowersshop.